This recipe is different from every other brownie technique I have ever encountered. It is reminiscent of roasting chicken or turkey, first, at a high temperature, then at a lower one to ensure a crisp skin. Similarly, Ms. Medrich’s technique produces a an outer layer, namely the top crust, which has a satisfying chewiness, with a moist interior, much like the poultry technique, which yields white meat which is not dry yet golden and crisp skin. Who knew brownies could benefit equally? 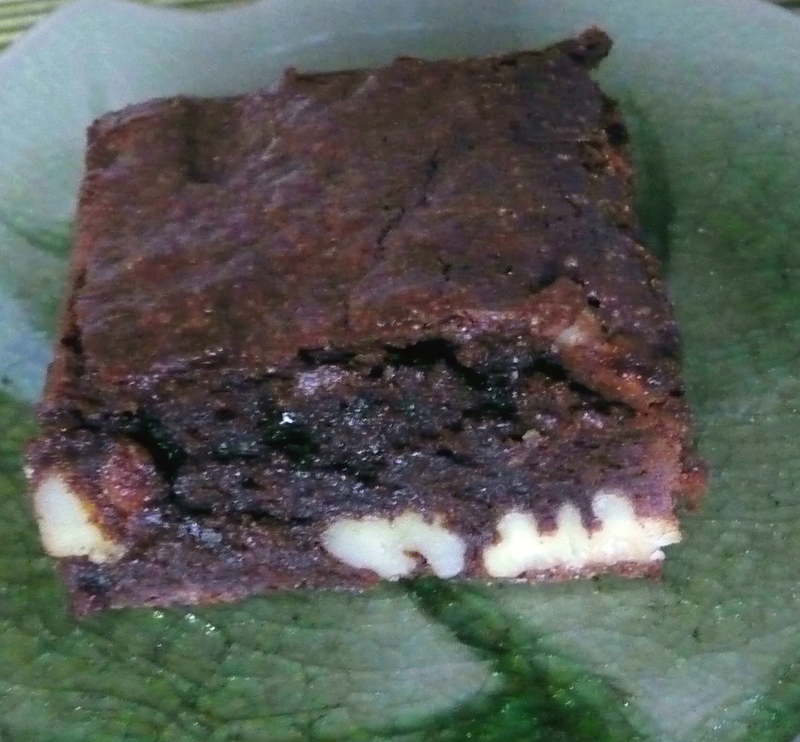 The brownie recipe itself is one which Ms. Medrich adapted from the Fannie Farmer classic. 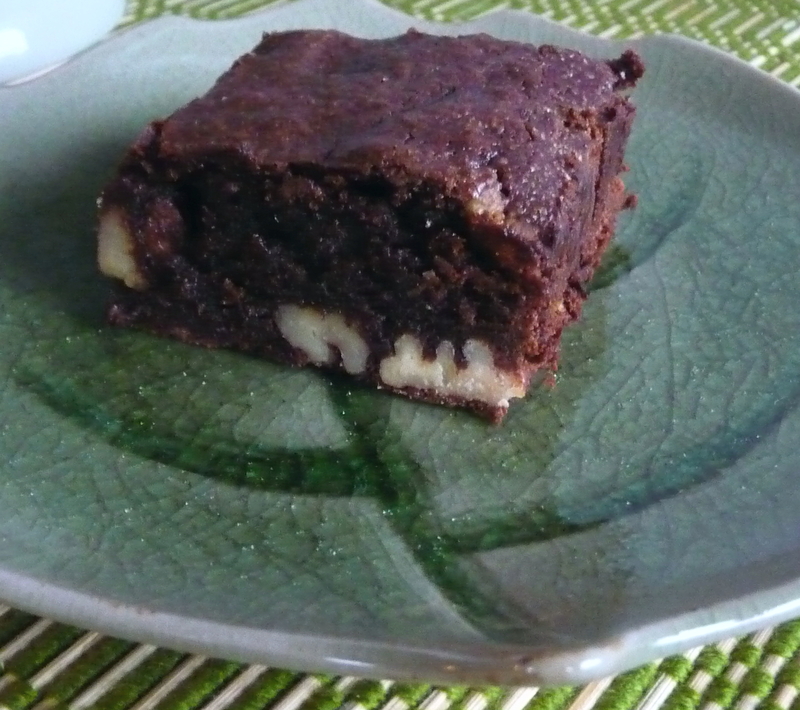 The author says that this technique works well for lower fat brownies, especially, as they can risk being too dry, particularly after a day or so. While the nuts are optional, I urge you to include them, as they provide a nutty-chewy counterpoint to the very creamy chocolate centre. With a rich crumb – not a hint of dryness – and the most creamy interior imaginable underneath a shiny chewy top-crust, the Steve ritual is worth trying, even if you are completely satisfied with your own arsenal of brownie recipes. Pre-heat oven to 400 degrees F (200 C or Gas Mark 6), with the oven rack at bottom-third position. Line 8” x 8” (15 cm) square metal pan with parchment paper or reuseable non-stick 8” square sheet. Melt butter and chocolate in microwave at 50% strength, at 30 second instalments, or until chocolate is almost melted; or melt the two in the top of a double boiler over simmering water, remove from stove top when just melted. Add sugar, salt, and vanilla to chocolate-butter, mixing thoroughly. Blend flour into wet ingredients, until just combined – do not over-mix. Fold in nuts gently, if using. Spread batter into prepared pan and place in oven. In the meantime, add ice cubes to the bottom of a 9” square pan (23 cm) or larger pan and fill half-way up with cold water. Remove pan from oven and place into ice-water bath immediately, ensuring that no water splashes over the pan onto the brownies. When fully cooled, take knife (or non-metallic spatula or knife, if using a non-stick pan) and insert around the four inner vertical edges carefully, just to loosen brownies. Remove the brownie slab from the pan, peel off parchment paper, and place on board to cut into 16 squares (2” x 2” or 5 cm x 5 cm). This entry was posted in Brownies, Dessert, Recipes Misc and tagged Baking, Brownies, Chocolate, Dessert, Recipe. Bookmark the permalink. Hi Dan, what a great find! I love the “accidental” way that this recipe variation came to be. Thanks, Mandy. Many great techniques seem to evolve by happenstance, I think, and this one works so well. I always learn something new when I’m reading your blog, and today was no exception. I never would have thought to use this water-bath technique, but I’ll have to try it the next time I make brownies! And not to add another brownie recipe to your arsenal, but have you ever tried Alice Medrich’s cocoa brownies? They’re fantastic. Thanks, Maddie. I enjoy sharing whatever I’ve learned with others, so I’m glad to hear that you manage to gain something fresh from visits. I’ve tried the cocoa recipe you mention, and it was very good – she does have a number of impressive varieties. Hi, Theresa. There’s so much in NYC that focus definitely helps there (I didn’t mention my interest in a rare-medium-rare hamburger, which I’d had at a bizarre place in Le Parker-Meridian called the “Burger Joint”…). Dan – these are almost like Swedish brownies but you don’t have to do the temperature change, they automatically become scrips on the top and chewy on the insides. 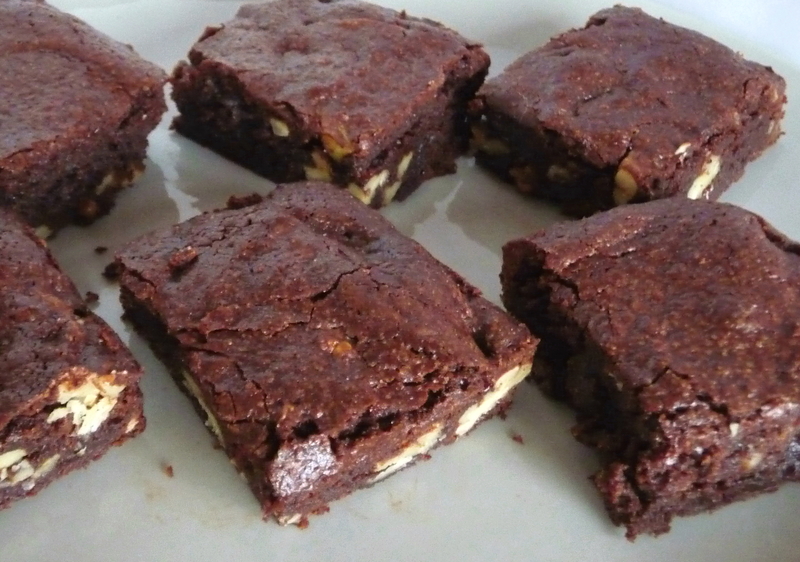 Do you really think that you will ever be satisfied with your brownie recipes? 🙂 i can eat brownie all day long and there are so many vaiations too the list just keeps going and going. I love this version though and it doesn’t having baking powder either even better. 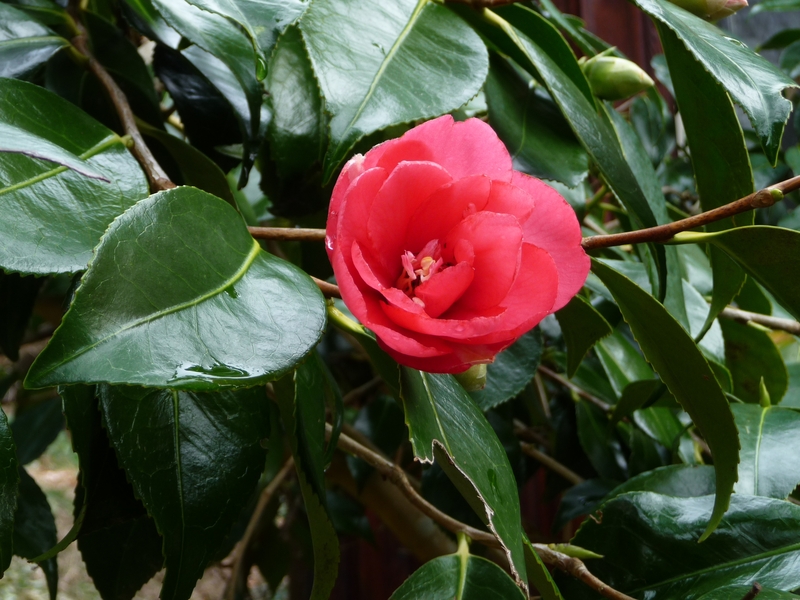 I hear you on the spring thing – what i love about it is the longer days. . . Thanks, Ewa. You’re too funny – I think you figured out that I can’t stop from trying out new recipes – despite how many I have that I like already. However, I do want to find the perfect super-chewy one…. Steve is an interesting guy, I assume (or was). What a strange thing to do to a brownie (an after baking water bath) but your pictures and words have convinced me that it is an ingenious way to change up brownies and get an entirely different but lovable texture. I am now thinking I need to go to the library more often. It never occurred to me that I could check out cookbooks…I know I am not the sharpest tack in the box. Hi, Geni. I don’t know anything about that Steve character, but his solution is amusing – and practical. Borrowing cookbooks helps you to get a sense of whether you want to buy a title, save space, and reduce your ever-growing pile of books which no longer fit into your bookshelves…just think how easy it is to explore without adding to credit card bills or stacks of books on the floor (well, the latter is my issue). Merci, Pierre. Tu te souviens les “brownies” des E-U comme un souvenir qui existe toujours, j’en suis certain! The Steve technique does indeed sound very intriguing. I’ll need to explore this for myself at some point. I have cookie tasting envy right now, and hope you’ll share with us your insights from these two cookies. I’ve made the compost cookie a few times, and have just loved the results, but not having the original to compare it too, hard to know how close I came. That’s an interesting technique. I doubt I’d be able to handle that but I know a friend who’s an ace at baking. Maybe, she can help me. Thank you for sharing the “Steve” technique.